I set off the fire alarm making this. It’s not as bad as it sound though, if the fire department had been summoned it might have been. You see this is not your run of the mill tomato based Gazpacho, but a tangier Tomatillo-Pepita Gazpacho and it’s green! As you might have guessed the vibrant green hue is a result of the tomatillo base and the broiling of them is also what set off the fire alarm. All things considered though this was still a perfect summer dish. Gazpacho could not be an easier, more appropriate use of the summer vegetable boon, and it’s basic ingredients list plus simple prep make it approachable to even the most apprehensive cooks. This version requires one extra step of roasting vegetables but was still ready in a flash even when you toss in an extra few minuets to throw open every door and window in your house and fan smoke from the fire alarm. I found this particular recipe in the July 2008 issue of Bon Appetite which always has the most gorgeous photos of their food. As with many recipes that i make I chose this one because it used alot of what I had on hand and the ingredient list was intriguing for a Gazpacho. My only prior experience working with tomatillos was using the canned version and so i wasn’t sure how to go about picking them for this recipe, but I just followed my gut and chose firm, unblemished ones; a post market consultation of Wikipedia told me that this is indeed is the mark of a good tomatillo. The soup also contains pepitas, or pumpkin seeds. When I first read this all I could think about was the ire that I would incur shelling them, but luckily pepitas are sold already peeled; thank god! I thought the flavors of this dish really complemented one another but some got a little overwhelemed by the acidity and tang of the tomatillos. In hindsight I would have increased the volume of certain ingredients and prepped others differently and i’ll make some suggestions in parentheses below. Over all this is definitely keeper and i’ll be trying it again with my tweaks. Salud! Prepare barbecue over medium high heat or set broiler to high. Toast the pepitas in a dry pan over medium heat string frequently until fragrant, then grind in a food processor. Barbecue or broil tomatillos and poblano peppers turning half way through cooking until skin is slightly charred 12-15 min. Upon removal of the tomatillos and peppers from the grill or oven add the tomatillos to the food processor and place the peppers in a plastic bag and twist to trap air. After 5 min. peel, seed and coarsely chop the poblano, and add it to the processor. Add in the garlic and process the soup to a coarse puree. Transfer soup to a large bowl and stir in the vegetable broth. Season soup with salt and pepper then refrigerate for 3 hours, until cold. Mix in remaining ingredients then serve alongside tortilla chips or quesadillas. Posted in main dish, Mexican, vegetarian. 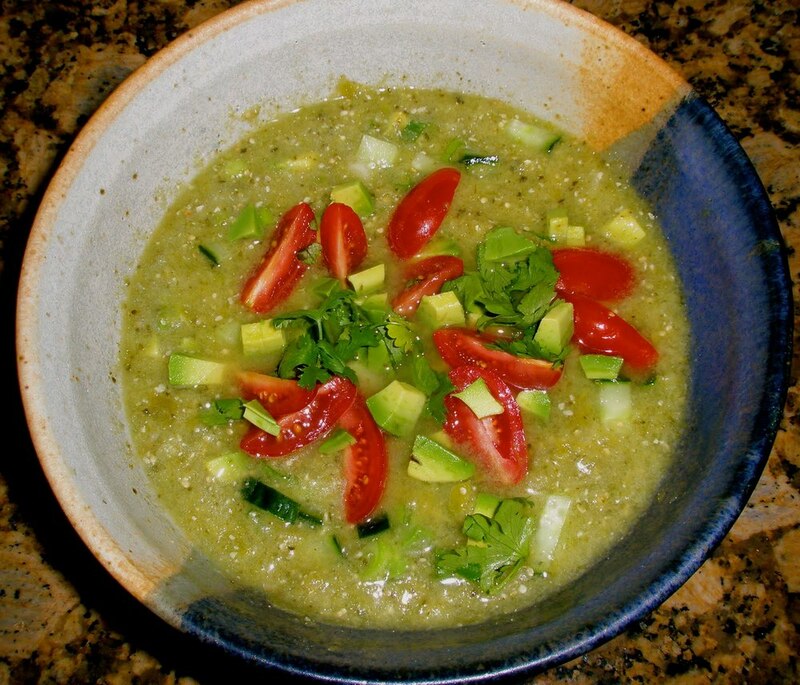 Tagged avocado, broth, cucumber, EVOO, onion, pepitas, poblano, stock, tomatillo, tomato. Previous: Previous post: P.B. Brownies the most decadent dessert in my arsenal! Next: Next post: Monster Cookies!